This entry was posted on March 27, 2019 by Anbritt. As the Augusta National welcomes a Women’s amateur tournament onto the course for the first time in history, my thoughts are about this groundbreaking moment for women’s golf and also about the women that have lead the sport throughout history. 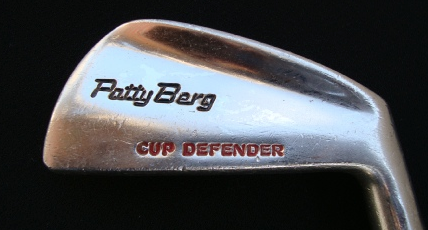 I remember seeing the name Patty Berg for the first time on the clubs in my mother’s golf bag. From her first clubs when she was a teen, all the way through her adulthood, her clubs were Patty Berg’s woods and irons. I started golfing when I was 3 years old and even before I was big enough, I was obsessed with those Patty Berg’s! I was convinced my little kid clubs were holding back my game. An original Patty Berg brand golf club. In the summertime, I golfed every week with grandparents and recall being told numerous times by them that Patty Berg was the greatest female golfer in history. 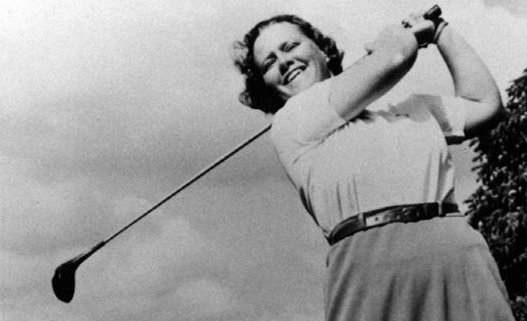 She was a founding member of the LPGA, and from 1937 to 1961, she dominated the game with 57 LPGA and WPGA tournament wins. She won 15 majors during her career including 7 Titleholders Championships, a tournament that was played at the Augusta Country Club, the course located next to the famed Augusta National Golf Club. The Titleholders Champion also received an honorary Green Jacket, similar to what is traditionally given to the winners of The Masters Golf Tournament. Here is where the cool history comes in. Jack Nicklaus holds the record for Green Jackets awarded to men at six, but most people don’t know that Patty Berg holds the record for Green Jackets awarded to women at seven! Berg won her seven Titleholders Tournaments over an incredible span of 20 years, from 1937 to 1957. Her ability to dominate and consistently win over several decades is why many consider her to be the greatest female golfer of all time. 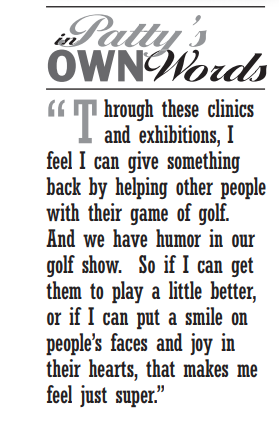 After Berg retired from tournaments, she taught the game to thousands of players at “Patty Berg Swing Parade” golf clinics across the country. It’s estimated she demonstrated at over 16,000 golf clinics up until her death in 2006. On April 3rd - April 6th the Augusta Women’s Amateur Tournament will be played at Champions Retreat Golf Club and the final will be played at Augusta National Golf Course, a course that has long kept women off the course and only recently allowed women to become club members. It’s frustrating that reaching this moment took so long, but also encouraging that it’s finally happening. If she were alive to day, I can imagine Patty Berg being at this tournament to celebrate this history and opportunity for the women’s game. Four of golfs greatest Women’s players – Nancy Lopez, Se Ri Pak, Lorena Ochoa, and Annika Sorenstam will be there to carry on Berg’s passion for promotion of the game of golf.